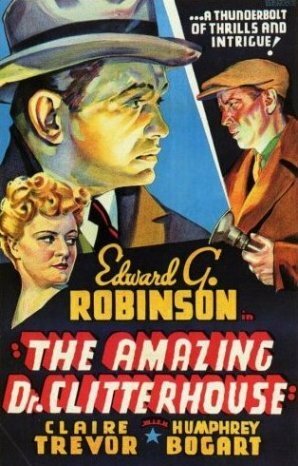 Ronald Reagan Appears in "The Amazing Dr. Clitterhouse"
The Amazing Dr. Clitterhouse is a 1938 Warner Bros.
crime film starring Edward G. Robinson, Claire Trevor and Humphrey Bogart. It was directed by Anatole Litvak and written by John Wexley and John Huston based on the first play written by short-story writer Barré Lyndon, which ran for three months on Broadway with Cedric Hardwicke after playing in London. 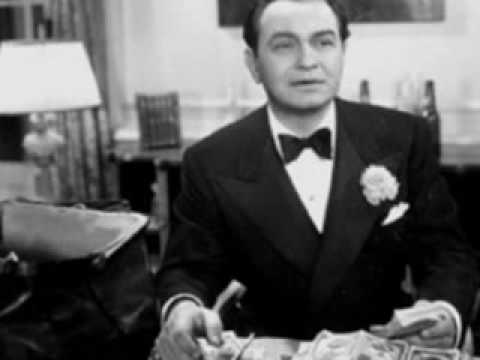 Dr. Clitterhouse (Edward G. Robinson) is a wealthy society doctor in New York City who decides to research the medical aspects of criminal behavior directly by becoming one. He begins a series of daring jewel robberies, measuring his own blood pressure, temperature and pulse before, during and afterwards, but yearns for a larger sample for his study. From one of his patients, Police Inspector Lewis Lane (Donald Crisp), he learns the name of the biggest fence in the city, Joe Keller. He goes to meet Keller to sell what he has stolen, only to find out that "Joe" is actually "Jo" (Claire Trevor). The doctor impresses Jo and a gang of thieves headed by 'Rocks' Valentine (Humphrey Bogart) with his exploits, so Jo invites him to join them, and he accepts. Dr. Clitterhouse pretends to take a six week vacation in Europe. As "The Professor", he proceeds to wrest leadership of the gang (and the admiration of Jo) away from Rocks, making him extremely resentful. When they rob a fur warehouse, Rocks locks his rival in a cold storage room, but Clitterhouse is freed by a gang member Jo had assigned to keep watch on him. Afterwards, Clitterhouse announces he is quitting; he has enough data from studying the gang during their robberies, and his "vacation" time is up. He returns the gang to Rocks' control. However, Rocks learns Dr. Clitterhouse's real identity and shows up at his Park Avenue office. Rocks tries to blackmail the doctor into continuing to plan the thefts. Clitterhouse learns that Rocks will not let him publish his incriminating research, and also realizes that he has not studied the ultimate crime – murder – so he poisons Rocks' drink. Jo helps dispose of the body in the river, but it is recovered and the poison is detected by the police. The doctor is ultimately caught by his friend Inspector Lane and placed on trial. He insists that he did everything for purely scientific reasons and claims that his book is a "sane book" and that it is "impossible for an insane man to write a sane book". His determination to show that he is sane, and therefore willing to face the death penalty, convinces the jury to find him not guilty by reason of insanity. Barré Lyndon's play, The Amazing Dr. Clitterhouse, had been a success in London, and was produced on Broadway in association with Warner Bros., but the studio had difficulty obtaining the movie rights even so, since Lyndon retained control of them. Carl Laemmle Jr., Paramount and MGM all bid for the rights, and Laemmle bought them for over $50,000. He then turned them around and sold them to Warners in return for the loan of Paul Muni for "The Hunchback of Notre Dame", a film that never got made. Producer Robert Lord originally wanted Ronald Colman to play the part of "Dr. Clitterhouse." The film was in production from late February to early April 1938 at Warner Bros. studios in Burbank. Clitterhouse was only Anatole Litvak's second film for Warners. * Ronald Reagan's voice can be heard as a radio announcer, a job that Reagan held before he started as a film actor. * Max "Slapsie Maxie" Rosenbloom was a boxer who converted his fame in the ring into a film career playing Runyonesque characters. * Susan Hayward had a part in the film, but her scenes were deleted. The Amazing Dr. Clitterhouse premiered in New York on 20 July, 1938, and went in to general American release on 30 July, and was mostly well received. The review in Variety called it "an unquestionable winner" and said that "Robinson...is at his best" and "Bogart's interpretation of the gangster chief...is topflight." Humphrey Bogart later said that the role of "Rocks" Valentine was one of his least favorite. Nearly all of the character names were changed when the play was filmed. The original play, with all of its original character names intact, has never been produced on American television, but the BBC has presented it on British television no less than four times - in 1947, 1951, 1957, and 1962. 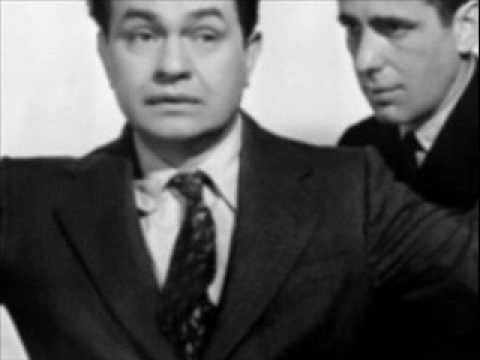 Edward G. Robinson shines in a fine comic role as Dr. Clitterhouse, a brilliant psychiatrist doing research into the criminal mind. The good doctor wants to gain a clearer understanding of how a thief feels when he's in the midst of a robbery, so strictly for academic purposes he tries to crack a safe at a high society party to which he's been invited. While trying to get rid of the jewels he swiped in the course of this experiment, Clitterhouse makes the acquaintance of "Rocks" Valentine (Humphrey Bogart), the tough-as-nails leader of a group of professional thieves.